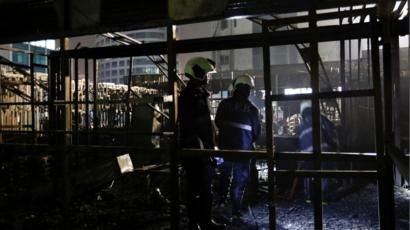 A massive late night fire that broke out at a Mumbai complex has killed at least 14 people, officials said. Six people have been hospitalised, the city's disaster management department told the BBC. The fire started at the 1 Above rooftop restaurant, Indian media reported. According to the Times of India, many of the guests tried to seek shelter in the bathroom and got trapped there. Most of the casualties were women attending a party. A 28-year-old woman who was celebrating her birthday died in the fire, according to her grandfather who spoke to the Reuters news agency. Kamala Mills is a refurbished industrial compound and houses several upscale restaurants, bars, and offices. Police have reportedly launched an investigation.